For this purpose I exploit the theoretical framework of classical density functional theory (DFT), Poisson-Boltzmann formalisms, diffusion equations, Fokker-Planck equations, the Ornstein-Zernike relation, and more. The Ornstein-Zernike relation grants access to structural properties of the systems under investigation. The most important model system I use is the primitive model of (charged) hard spheres. The impact of this model stems from the fact that many short-ranged repulsive pair potentials from colloidal soft matter systems can be mapped onto that of hard spheres. For this reason, the initially purely theoretical model has been reconstructed in laboratories to unveil even its last secrets. Figure 1. 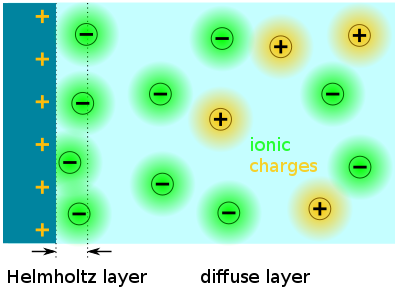 Sketch of the electric double layer (EDL) at a positively charged flat electrode. Figure 2. Sketch of (from right to left) a supercapacitor, its porous electrode, and the EDL. Figure 3. 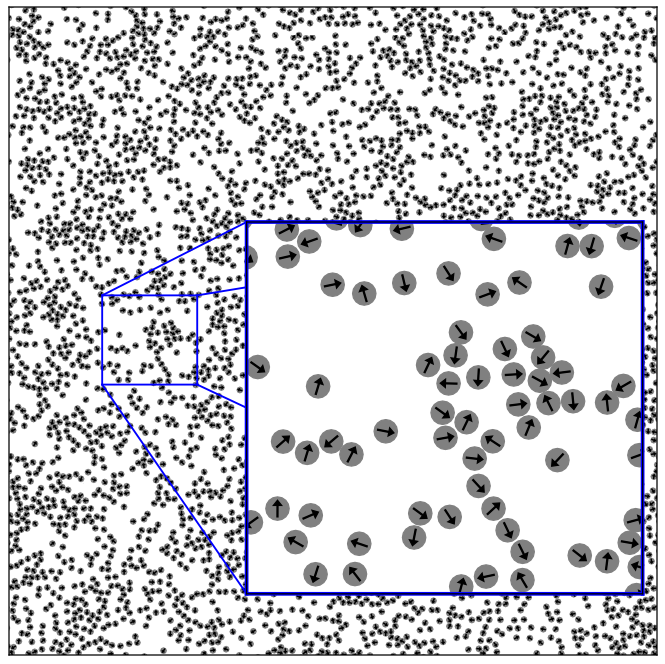 Snapshot of a system of active Brownian disks.